The Hollywood Sign, which was officially completed on December 8, 1923, celebrates its 95th anniversary today. It has had a remarkable and turbulent history and has endured its share of problems, including a suicide leap from the H, squabbles over who should maintain it, markings from mountain-climbing spray painters, hassles among community groups about its worth, battles with local residents to keep hikers from it, and threats over the years to tear it down. The sign has been a part of the local scenery for 95 years, longer than many city landmarks such as Grauman’s Chinese, City Hall, the Shrine Auditorium and UCLA. It even predates Mulholland Drive and is decades older than any freeway. As many know, the Hollywood sign is the remnant of an advertisement for a 640-acre real-estate development. 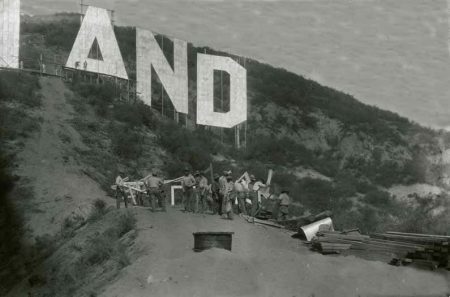 When it was erected in 1923, the sign spelled HOLLYWOODLAND, the name of the housing development on the slope below it. The sign, however, was an afterthought. In the spring of 1923, John Roche, a 26-year-old advertising and promotional man, was working on a brochure for the Hollywoodland subdivision. He had drawn in proposed home sites, streets and equestrian trails. Behind them, on the side of Mt. Lee, he had penciled in HOLLYWOODLAND. 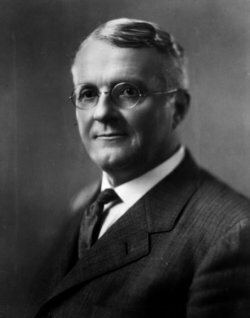 Harry Chandler, then publisher of the Los Angeles Times, was one of the project’s developers. When Roche arrived at his office with the drawing, Chandler liked the idea and wanted to know if a sign could be erected that could be seen all over Los Angeles. For a good perspective, Roche drove to Wilshire Boulevard, then a little, partially asphalted road, to see if he could see the mountain from there. Roche took photographs and made drawings of the Hollywood hills. Roche calculated that each letter would have to be 50 feet high to be visible from that distance. When he reported to Chandler that such a sign would be seen, the project began. As Roche had determined, each individual letter was built 50-feet high and 30-feet wide. They were assembled on metal panels, each three-by-nine-feet, and painted white. The next step was attaching the panels to a framework that consisted of wires, scaffolding and telephone poles, which were brought up the steep hillside by mules. Fifty to one-hundred laborers dug the holes with pick axes and shovels. An access road was completed so the enormous sheet metal letters could be brought in. The sign was completed in about 60 days at a cost of $21,000. 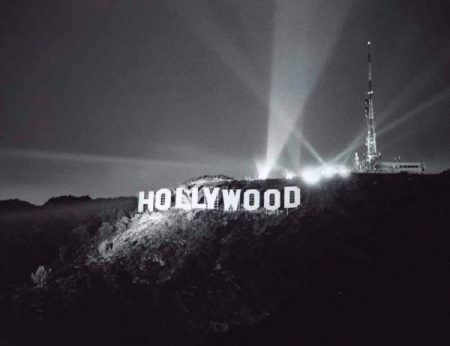 Years later, Roche said: “I think we built it faster than you could today (1984).” Roche recalled the sign being lighted, but insisted there were no lights on the original HOLLYWOODLAND. “That came sometime later,” he said. At some point, the sign was illuminated at night by 4,000, 20-watt bulbs, evenly spaced around the outside edge of each letter. This required a caretaker (Albert Kothe, who lived in a cabin behind the first “L”), who maintained the sign and its lighting system. To replace burned out bulbs, Kothe would climb onto the framework behind each letter, the new light bulbs tucked in his shirt. Since it was planned to promote real-estate, it was not designed to survive the sale of the last lot. Public sentiment, however, led to keeping the sign long after its commercial function was over. During the sign’s heyday, many stars bought homes in Hollywoodland. The highest lot above the sign was sold to comedy producer Mack Sennett, but he never built there. Sennett did use the sign, though, to pose bathing beauties between the O’s for publicity stills. In 1939, the lights were extinguished when the maintenance fund was discontinued by the realtors. It’s rumored that soon after, all 4,000 bulbs were stolen. In 1945, the development company that owned it donated the sign and the land surrounding it to the city’s Recreation and Parks Commission as an adjunct parcel to Griffith Park. The sign, by this point, had been neglected and vandalized for several years. In January 1949, the “H” blew down in a windstorm, and nearby residents complained that the sign was a hazard and an eyesore. On January 6, the Recreation and Parks Commission announced that the sign would be torn down. 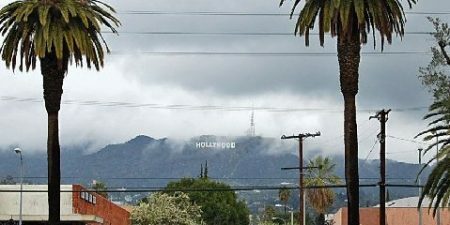 They denied a request of the Hollywood Chamber of Commerce to alter and repair the sign to read HOLLYWOOD. 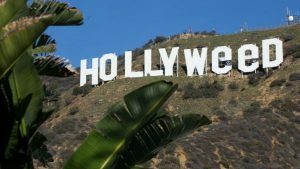 The parks commission later reversed its decision and allowed the first nine letters to be repaired, and removed the last four letters to read “HOLLYWOOD,” therefore transforming it from a commercial display into a community one. By the early 1960s, weather again had taken a strong toll on the sign’s condition. At a cost of $4,500, it was restored by the Kiwanis. At irregular intervals, several civic groups had the metal facing repainted, but little structural maintenance was done. In 1973, the city once again threatened to tear down the sign. The Hollywood Chamber of Commerce and local radio station KABC, began a “Save the Sign” campaign hoping to solicit $15,000 from the public to finance structural repairs, replace fallen facing panels, and give it a fresh coat of paint. That same year, the Los Angeles Cultural Heritage Board designated it a monument, thus giving it dignity but no money. One woman sent the repair fund a large check with a note: “My little girl in 1925 learned to spell from the sign.” Another recalled a proposal of marriage made to her in 1944 near the sign; she “foolishly” rejected it, but wondered how many accepted proposals were made there. A third woman calculated that if “All the couples who parked up there sent in $1, there would be more than enough.” Fortunately, the campaign was successful and the sign received a facelift and a reprieve–but it wouldn’t last for long. On January 1, 1976, several young men, to mark the change in the marijuana law in California, masked the OOs with EEs made from white sheets. 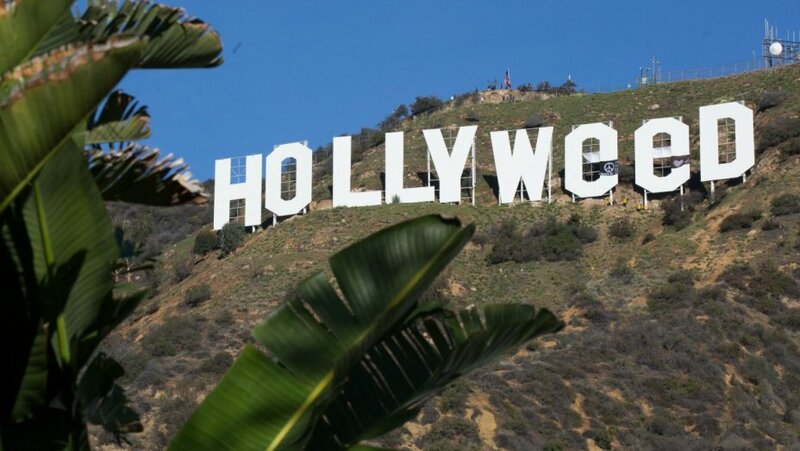 It read HOLLYWEED for a day. A year later, the “D” became wobbly because of recent rainstorms and there was concern about how long it would stay in place. Up close, the sign creaked and rattled, even in a light wind. Its timbers were rotting. Sheet metal, rusted and corroded, fell from its face and loose securing cables dangled from some of the 50-foot high letters. It was estimated that a replacement sign would go as high as $120,000. To generate interest in preserving the sign, a press conference was held at the base of the sign with invitations sent out accompanied by a snake bite kit. CLICK HERE to watch the opening credits (3 minutes) of Savage Intruder (1970), the last film of actress Miriam Hopkins. 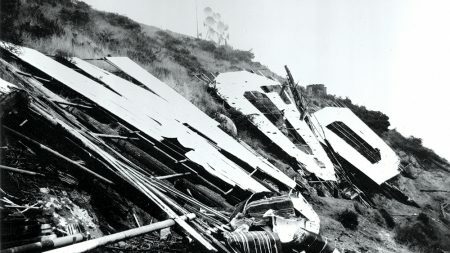 It has creepy, close-up, footage of the deteriorating Hollywood Sign before it’s restoration. A few months later, in April 1977, the sign was altered to read HOLYWOOD for Easter Sunrise service, viewable from the Hollywood Bowl. The following winter, the final blow came as wind and heavy rainstorms once again took a toll on the sign. The top of the first O fell off, the Y buckled inward toward the hillside, and the last O collapsed completely. A campaign was established once again to “Save the Sign.” Eventually, after several efforts to raise money was not sufficient, nine donors came forward; each chose a letter and contributed $27,777. The donors who paid for each letter included: (H) newspaper publisher, Terrance Donnelly; (O) Italian movie producer, Giovanni Mazza; (L) Les Kelly (Kelly Blue Book); (L) Gene Autry; (Y) Hugh Heffner; (W) Andy Williams; (O) Warner Bros. Records; (O) Alice Cooper, in memory of Groucho Marx; (D) Dennis Lidtke. 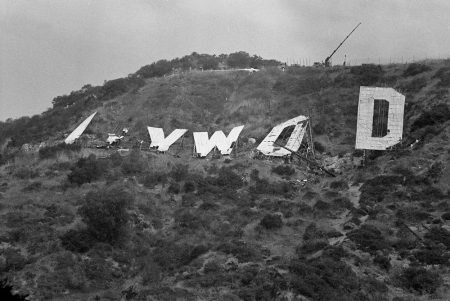 The new letters, made of steel, were unveiled on Hollywood’s (so-called) 75th anniversary, November 14, 1978. Over the following years, unauthorized alterations have been made to the sign. In July 1987, it was changed to OLLYWOOD, (Ollie North) during the Iran-Contra hearings. During the Gulf War it read OIL WAR and in 1993, 20 members of UCLA’s Theta-Chi fraternity changed it to GO UCLA. The students were charged with trespassing, prompting the installation of a security system featuring video surveillance and motion detection. However, it didn’t prevent another institution of learning to alter it to CALTECH ten years later. In any event, here’s hoping the Hollywood Sign will continue to look out over the Hollywood community for 95 more years and more.